Previous Research - Sheila A. Kitchen, Ph.D.
Taylor (2009) recorded first action potential from marine diatom. The potent neurotoxins produced by Karenia brevis , brevetoxins (PbTx), cause membrane hyper-excitability and alter sodium voltage-gated channel kinetics in animals. ​We tested the effect of brevetoxin exposure on the VGCs of diatoms, ecologically relevant targets for these waterborne toxins, using current- and voltage-clamp recordings. We found a unique interaction, where relatively high concentrations of PbTx changed the permeability of the sodium VCGs by 33% but did not alter channel kinetics. Thus, at environmentally relevant concentrations, we predict that the effects of PbTx on diatom sodium VGCs will be limited. Microelectrode impalement of O. sinensis under perfusion of 1uM PbTx-3 in artificial seawater. 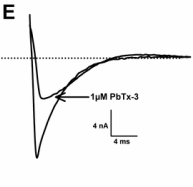 Inhibitory effect of PbTx-3 on inward Na+ current. The uptake of fluorescently labeled PbTx observed in the same diatom species examined by electrophysiology above indicates these lipophilic molecules are rapidly taken up by the cell where they not only remain within the cytoplasm, but also selectively accumulate in neutral lipid bodies, including lipid bodies associated with the chloroplast. This suggest a novel but potentially significant route of toxin transfer in microbial food webs to primary and secondary consumers. Ben Kramer followed up on this work surveying localization of labeled PbTx in a variety of additional marine microbes (coccolithophores, dinoflagellates, ciliates, rotifers, cryptophytes, and cyanobacteria). 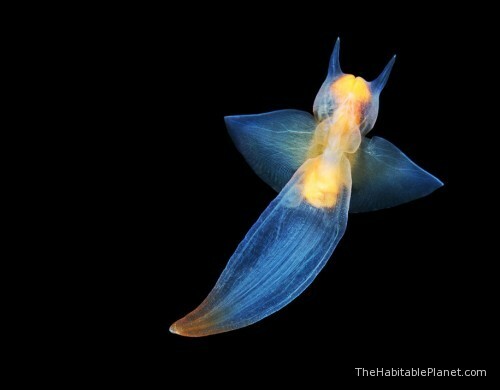 The pterpod mollusc, Cliona limacina, undergo significant neurophysiological and biomechanical changes during the transition from slow to fast swimming speeds used in prey capture. We used an antibody to hyperpolarization-activated cation channels that specifically localize to dorso-ventral muscle cells to determine their distribution in the wings. Contraction of these muscles near fluid-filled cavities (hemocoel) can alter hydrostatic pressure and play a significant role in wing stiffness during accelerated swim speeds. We found that the muscles innervated the entire wing but more prevalent in hemocoelic spaces between oblique muscles and attached to epithelial tissue. This arrangement creates an antagonistic system between the muscle cells and hemocoel which decreases wing thickness and increases stiffness during contraction.